Everyone knows the top scorer takes the prize. The same is true with food. The ORAC system rates the antioxidant levels of different foods, and the ingredients in Berry Complete High ORAC Complex from Life Extension earned top marks. 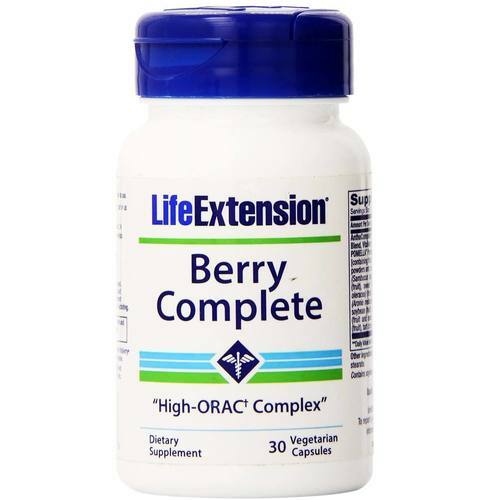 Berry Complete High ORAC Complex from Life Extension is packed with fruits like pomegranate, blueberries and cherries. These fruits, with their bright colors, are rich in antioxidants, which protect your body from damaging free radicals. The fruits and vegetables selected for this product have received the highest ORAC scores. Berry Complete High ORAC Complex is part of Life Extension's line of Berry Complete products for antioxidant protection. Try it today at eVitamins. Advertências: When using nutritional supplements, please consult with your physician if you are undergoing treatment for a medical condition or if you are pregnant or lactating. Notas: Contains soybeans. Contains corn. Contains no milk, egg, fish, peanuts, crustacean shellfish (lobster, crab, shrimp), tree nuts, wheat, yeast, gluten, or rice. Contains no sugar, and no artificial sweeteners, flavors, colors, or preservatives. Recomendações de uso: Take one capsule daily with or without food or as recommended by a healthcare practitioner.